No. 3 Nebraska took control in the fourth quarter of Friday night’s quarterfinal match with No. 6 Michigan and advanced to the semifinals of the 2018 Big Ten Tournament with a 61-54 win. The Huskers (21-9, 11-5 Big Ten) led the Wolverines for 34 minutes, but never created any breathing room until late in the fourth. Through three quarters, Nebraska had connected on just 32 percent of its shots. That number soared to 56 percent in the fourth. Still, with just over four minutes left, a bucket from Michigan’s Hallie Thome turned what was once an eight-point second-half lead into just a one-possession game. But Nebraska ripped off a 10-3 run to close the game and seal a win — Michigan added a bucket at the buzzer, its only made shot from the floor over the final four minutes. Leading the way was guard Hannah Whitish, who scored seven of her 17 during the run. Whitish struggled with her shot to close out the season; head coach Amy Williams maintained that she wasn’t worried about her floor general’s confidence or shot selection, Whitish just needed to find a rhythm. She found it down the stretch against Michigan. The sophomore point guard labored through a rough-shooting first half, with seven points on 1-of-7 from 3-point range, but she was nearly perfect in the second half. Whitish connected on three of her four shots. 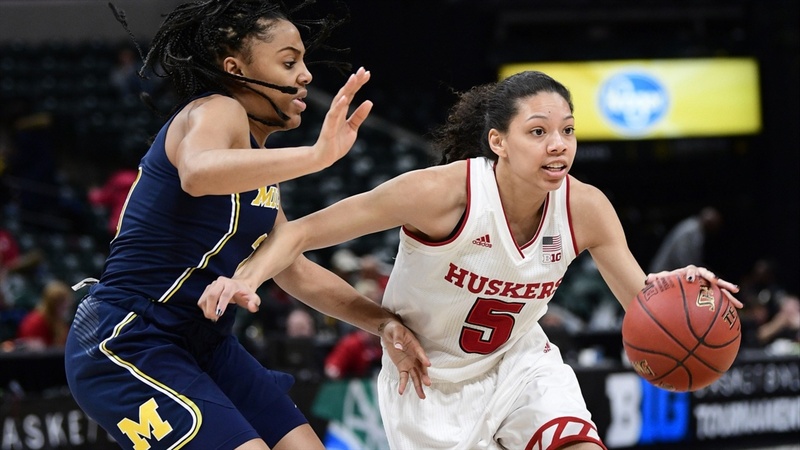 She finished with 17 points, seven boards, three assists and two steals to pace the Huskers who, as a team, shot just 38 percent for the game. Freshman center Kate Cain fouled out after 30 minutes of work but stuffed the stat sheet on her way to six points, seven boards, seven blocks and three assists. Guard Nicea Eliely finished with 12 points and six boards. The Huskers' bench was outscored 10-8 in one of its less efficient outings. Williams elected to shorten the rotation, only playing three off the pine. Guard Janay Morton had five of those eight points, but struggled with her shot and missed eight of her 10 looks. The Huskers will be back in action again Saturday against No. 2 seed Maryland with a trip to the championship game on the line. It’ll be the third meeting this season between the Huskers and the Terrapins, with Maryland taking both in tight affairs. The game is set for a 7:30 p.m. CT tip.